Intended use: Foot conditioning, tempo runs. Suited for forefoot/midfoot strikers. Give this shoe a try if you like minimalist running shoes. Fits great and rides well. The Nike Free 3.0 v4 gets a fresh sole, a radical upper design refresh and then some. Here’s our report on the brand new Free 3.0, Nike’s newest minimalist running shoe for summer 2012. 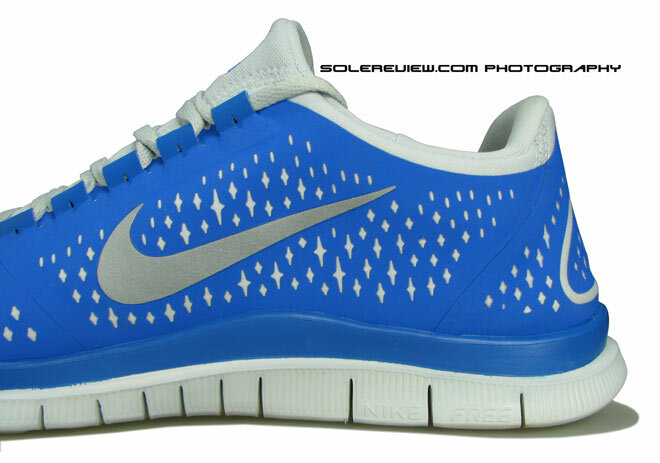 The shoe you see up there is the first Nike Free 3.0 V1 released in summer 2007. When I saw it for the first time, it reminded me of the Nike Mayfly – a super lightweight mesh-and-foam raceday shoe, which existed only for a single goal – finish the race, and then self destruct. 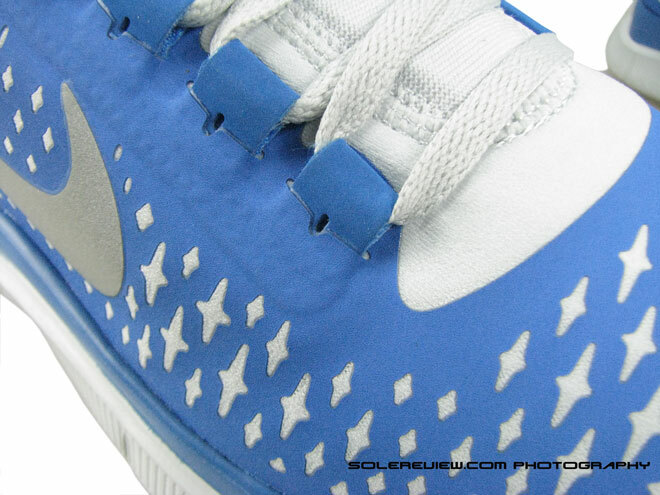 The Free 3.0 V1 had an all mesh upper, with no overlays at all. 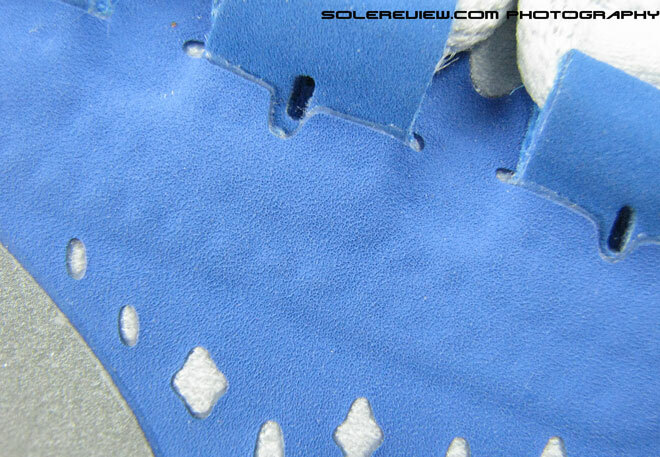 The eyelets were simply sewn in, and the heel area somehow managed to stay in place, thanks to the soft chamois type of collar lining which extended from tongue opening to around the heel area. Below the upper, the outsole was designed with wide, flex grooves in the forefoot and midfoot area, an exercise in extreme flexibility. It was bold attempt by Nike, but after running in them, I thought the shoes to be average. They were pretty pricey too, for what it was. And while the shoe found some runners who absolutely loved it, it did not seem to catch favor mainstream. 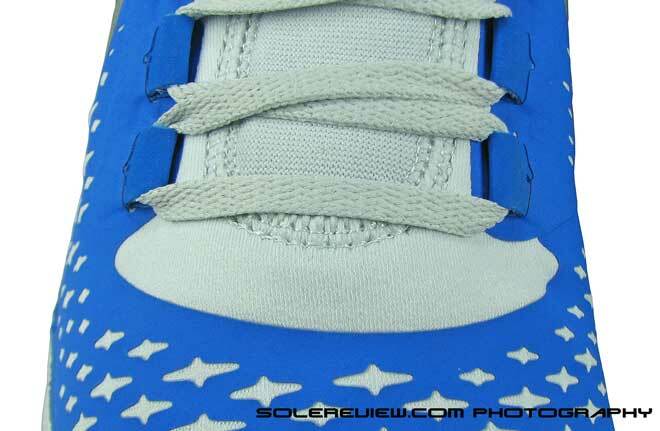 The later versions of the Free 3.0, namely the V2 and the V3, utilized the same outsole unit with redesigned uppers with more overlays on the mesh. 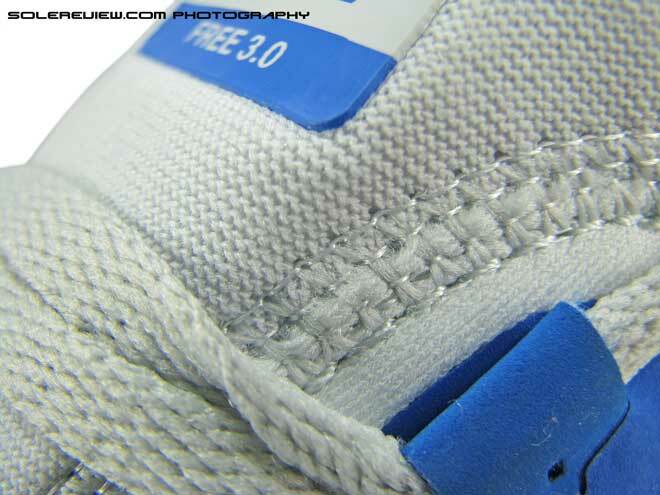 Last year’s Free 3.0 had a stretch heel area and a Free Run 2 kind of welded overlays over the midsection. My original plan was only to review the Nike Free Run 3 and then move on to other pending reviews, but this is what happened: Nike invited me to one of their running training programs, and I showed up there in a pair of Lunarglide 3’s. 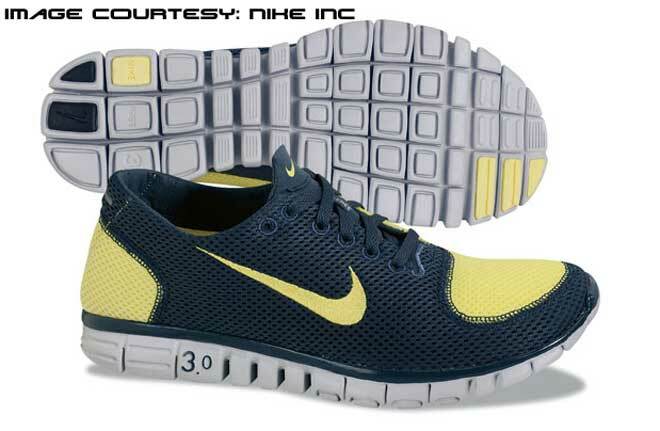 I had already received a pair of Nike Free Run+ 3, so they casually asked me whether I did not like the Free Run 3. I explained that it was half a size too big for me, so I preferred to run in the LG3. It so happened that Nike had a pair of Nike 3.0’s lying around in my size, so they gave me a pair for the training run. I took off my Lunarglide 3, flung them in the backseat of my car and then slipped into a pair of mint fresh Nike Free 3.0’s. Then something strange happened. Let’s assume, for a moment, that after finishing a meal at a restaurant, you decide that the place was average. Not great, not bad, but average. You make a mental note of the diner, and store it away in a corner of your brain. A few months later, you’re invited for dinner at the same restaurant, and while you are not particularly excited about eating there, you trudge along anyway. The restaurant looks much better than it did before, and you go, ‘Hmm. New management, perhaps?’ After you’re seated, service comes quick and efficient, and you think, ‘ Nice. Things have surely improved over here’. Then comes the food. You ordered a burger the last time, and it was very average. This time too, the host serves burgers around, and you say thanks and then take a big bite, not really expecting much. The soggy buns has been replaced by freshly baked buns, still warm from the glow of the oven. The tasteless bacon strips have been replaced with wood smoked Bacon, the seasoning tastes amazing, and the blackened patty is perfectly done, with the right texture and flavor. Rather shocked by the newness of it all, the brain replaces the old ‘ this place is average’ memory with a new ‘this place is awesome!’ memory. After the intense drama is over, you sit overwhelmed, still smarting from the freshness of the experience. You try to nitpick, and realize that the chair is somewhat uncomfortable, but you let it pass in the glory of the moment. That is what happened to me, really. I haven’t been in a pair of Nike Free 3.0’s since 2007, and when I slipped into a pair of the new Nike Free 3.0 V4, I felt this tidal wave of new sensations flowing over. I began running on the Tartan tracks, slowly taking in the updates on the new Free 3.0. 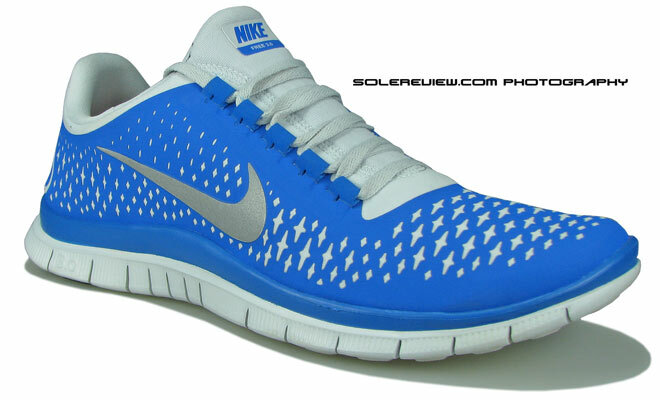 The Nike Free 3.0 V4 went under the knife for its summer 2012 release, and has come out completely redesigned. All parts of the shoe have undergone a radical design transformation, so the shoe we review today has little in common with the V1, V2 and V3 3.0’s, save the underlying minimalist running concept. The Nike Free 3.0 sits in the upper tier (see chart in ourFree Run 3 review) of Nike’s attempt to provide a barefoot running experience, so the Free 3.0 has a heel to toe offset of 4mm (17mm heel, 13 mm toe) as compared to 6mm and 8mm for the 4.0 and the Free Run+ 3. The human foot has an offset of 0mm, so 4mm gets pretty close as far as the promise of delivering a barefoot like run is concerned. 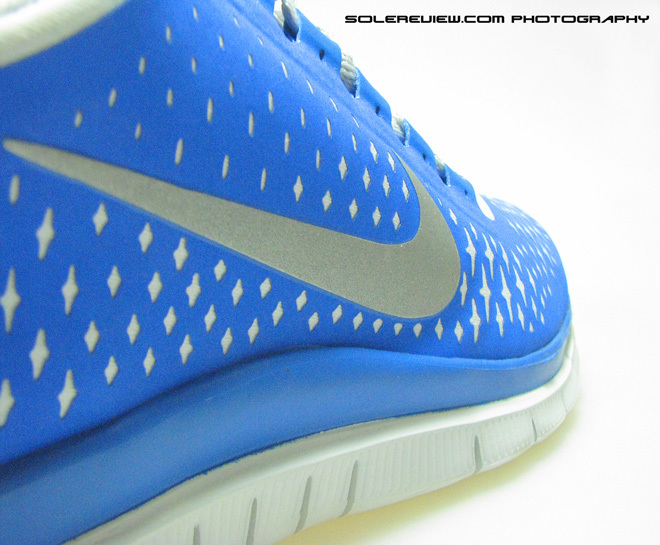 In our review of the Nike Free Run 3, we discussed Nike’s use of a no-sew technology, which they call Nanoply. This is used extensively in the Free 3.0 V4, and it makes a huge impact as far as the fit is concerned. The upper construction of the Free 3.0 is rather remarkable; one huge, seamless panel of the Nanoply runs the entire length of the lateral (outer) side, and is joined to a smaller piece by fused seams on the inner side. So looked on from the outer side, the entire shoe looks seamless. The thickness of the upper material is wafer thin, and is fused on to a base layer of a moderately stretchy fabric. Finely cut star shaped perforations go all over the surface, resulting in a visually striking appearance, 360° ventilation and eliminating any hot spots. The upper has an integrated tongue, making the Free 3.0 fit like a pair of socks. Unlike the previous versions, where the surface of the upper had zones of mesh and synthetic leather, the Free 3.0 has a uniform feel to it. The use of Nike Nanoply all over the exterior of the shoe, combined with a bootie build and a near seamless interior environment, results in the Nike Free 3.0 feeling like a pair of snug, compression socks attached to a sole. The overall feel is extremely confidence inspiring during a quick run; the foot stays locked down in place, there are no hot zones and the shoe flexes well in the forefoot without the upper material accumulation. The Nike Free 3.0 has a cleverly designed cutout area (see picture below) which prevents bunching up of the upper when the shoe bends; the absence of the fused synthetic allows for irritation free forefoot flexion. Major revisions take place on the outsole of the Nike Free 3.0. The big gaps between the grooves in the forefoot and midfoot are now gone, and in its place, a tightly packed cluster of deep flex grooves extending right from under the ball of the foot to the heel. Instead of the straight left to right midfoot flex grooves in the earlier version of the Nike Free, the latest one has diagonal siping running across the arch. There is also a channel running the length of the sole, starting from the center of the heel and stopping just short of the ball of the foot. The channel helps in a stable gait transition, helping the foot maintain its line. The outsole does not feel as spartan as the previous one – while the Nike Free 3.0 has a heel to toe offset of only 4mm, it is worth mentioning that the heel is still 17mm high(and the toe 13) from the surface you’re running on, so it’s not like you are going to feel every piece of debris you run on. The foot is well shielded from the small pebbles you might encounter during your run, with adequate cushioning and support built in. The Nike Plus socket is not available in the Nike Free 3.0 V4, so if you have the standard Nike Plus receiver/transmitter set up, you can’t use them on this shoe. But if you own the latest gen iPod (with the built-in accelerometer) or the Sports Watch, then you should have no worries at all. The outsole grip is adequate on gravel, tarmac and indoors, and we’ve had no issues so far with the outsole stability. And how does everything come together in the new 3.0? The upper fit and feel is absolutely brilliant, the new Nanoply stretching taut over your foot. The collar area grips well, and we didn’t experience any slippage during the last 40 miles we’ve done on the shoe. The outsole comes with noticeable improvements, with the flexibility and low offset working in tandem to work your forefoot muscles. A note of caution, though, before we bring this review to a close. The new Free 3.0 is true to size, and has an extremely snug fit. We experienced a mild soreness on the upper area of the left foot when we ran in the Free’s with a pair of sports socks, though the pain disappeared after a few hours. We’ll switch to running in these shoes with socks, and we’ll be back with an update. But don’t let this scare you, the new Free 3.0 is a brilliantly executed minimalist running shoe, and if you’re in the market for a such a shoe, the Nike Free 3.0 is worth having a look at. Tester note: If you have never run in a pair of Nike Free’s before, try to start slowly instead of making this a 100% replacement for your previous running shoe. We were talking to a couple of new (to Nike Free) runners who were using the 5.0/3.0 full time and ended up with a sore arch and forefoot . The best way to do this is to start using the Nike Free like a meal supplement – run in your regular shoes for 70% of your runs, and then for that weekend run or the evening sprint, lace up the Free 3.0’s. These nifty little kicks take some time getting used to.